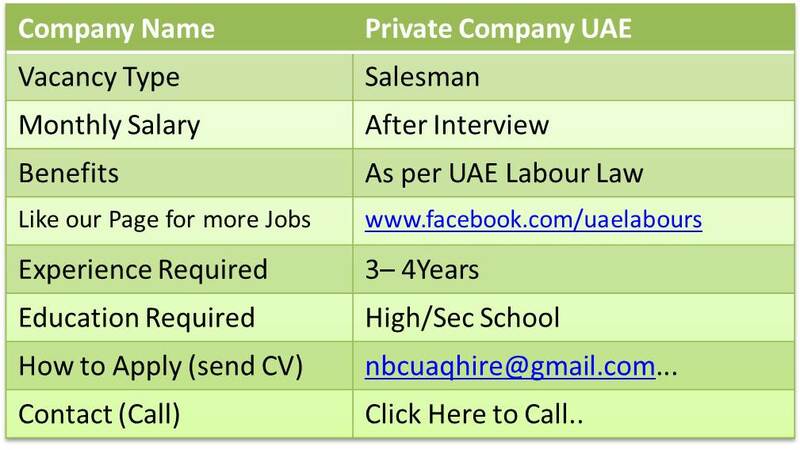 Sales Jobs are the mostly demanded jobs in UAE. SALESMAN (Water Delivery) required with local experience of minimum 3 years with good customers contacts to market PET Bottled Drinking Water of a reputed brand in all emirates. Salary plus commission plus accommodation plus other benefits. Job Location: Company is located in Emirates Modern Industrial City, Umm Al Quwain, UAE. Benefits: Company will provide Below Benefits to the Successful Candidates. If you have the skills and experience which is required for Sales Man, please forward your resume to below Email Address, or through Below Provided Contact Number, Shortlisted Candidates will receive confirmation email.